Received January 28th, 2011; revised April 17th, 2011; accepted May 11th, 2011.
incidence of radical innovation recommendations. formalized Lean Six Sigma or related program. The remainder of the article is organized as follows. section details the configuration of the resulting data set. tional solution that a customer did not previously receive. uct” to describe a service sold to financial customers. techniques found under the Lean or Six Sigma umbrella. projects, such as the DMAIC approach of Si x Sigm a .
for ensuring the quality of their results. 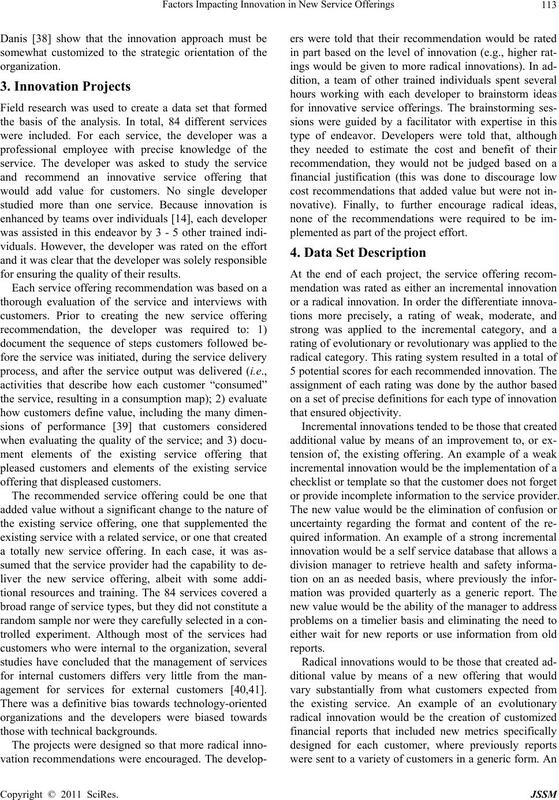 agement for services for external customers [40,41]. plemented as part of the project effort. or provide incomplete information to the service provider. equipment and charge relevant departments accordingly. rating of the recommended new service offering. (7.2%) of the recommendations were rated as radical. ratings fell into the weak innovation category. Table 1. Distribution of recommended innovations. Table 2. Innovation ratings across process types. fering from different types of service processes. lenging whether the customer is internal or external. Table 3. 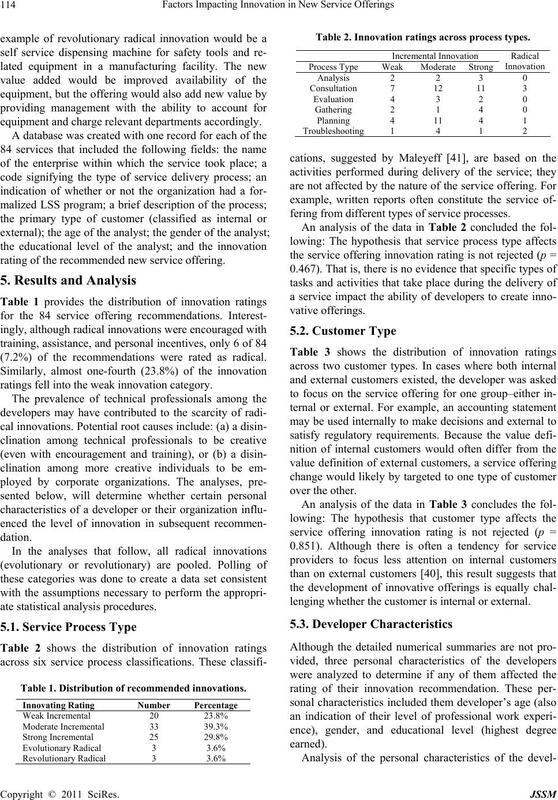 Innovation ratings across customer types. recommendations having a higher level of innovation. within other organizations is not rejected (p = 0.081). Table 4. 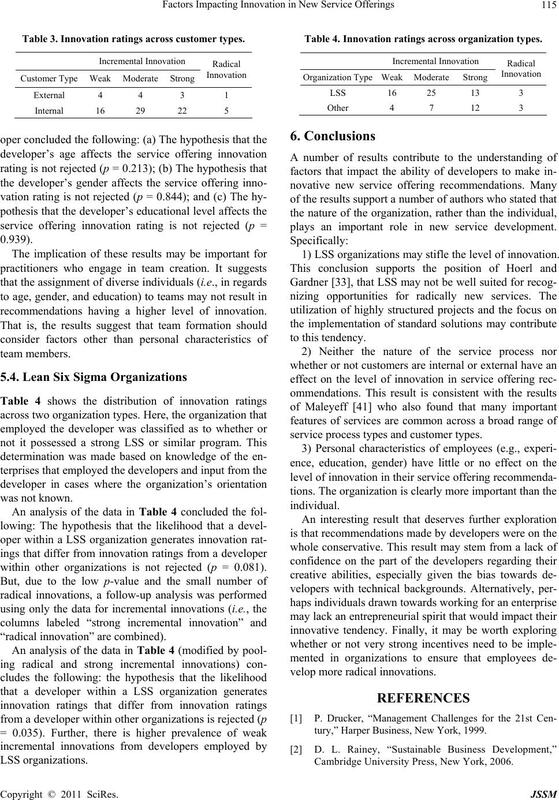 Innovation ratings across organization types. plays an important role in new service development. 1) LSS organizations may stifle th e level of innovation. service process types and customer types. tury,” Harper Business, New York, 1999. Cambridge University Press, New Yo rk, 20 06. Vol. 4038, 2007, p. 11.
zine, Vol. 6, No. 3, 2007, pp. 15-21.
ness Week, Vol. 4147, 2009, p. 80. Vol. 45, No. 4, 2004, pp. 31-37. 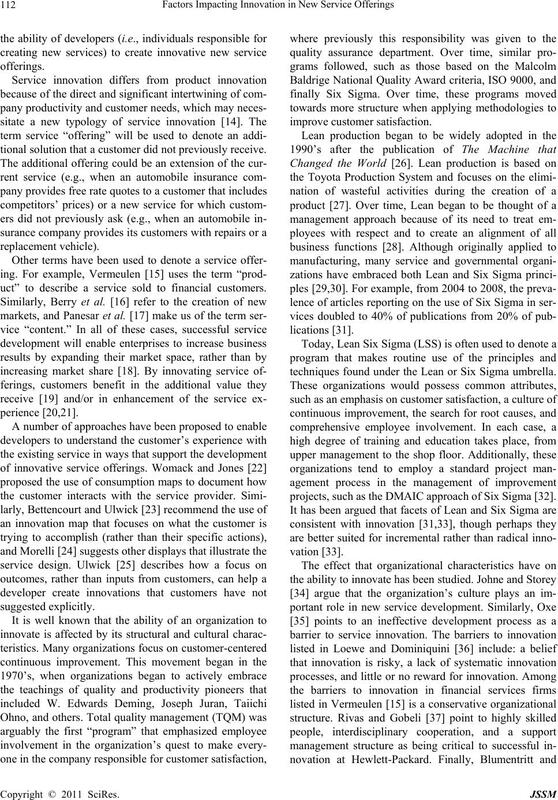 Innovation,” The Academy of Management Review, Vol. 33, No. 4, 20 08, pp. 8 25- 845 .
ness School Press, Boston, 2007. Service Sciences, Vol. 2, No. 3, 2010, pp. 277-286. Vol. 22, No. 1, 2004, pp. 43-50. No. 2, 2006, pp. 56-63. No. 2, 2008, pp. 174-193.
Review, Vol. 42, No. 1, 2000, pp. 27-37.
keting, Vol. 32, No. 11-12, 1998, pp. 1091-1109.
Review, Vol. 43, No. 3, 2002, pp. 85-89. Harvard Business Review, Vol. 83, N o. 3, 2005, pp. 58-68.
view, Vol. 86, No. 5, May 2008, pp. 109-114. Technology Management, Vol. 20, No. 5, 2009, pp. Harvard Business Review, Vol. 80, No. 1, 2002, pp. No. 5, 2006, pp. 674-689. Sigma, Vol. 1, No. 1, 2010, pp. 30-38. 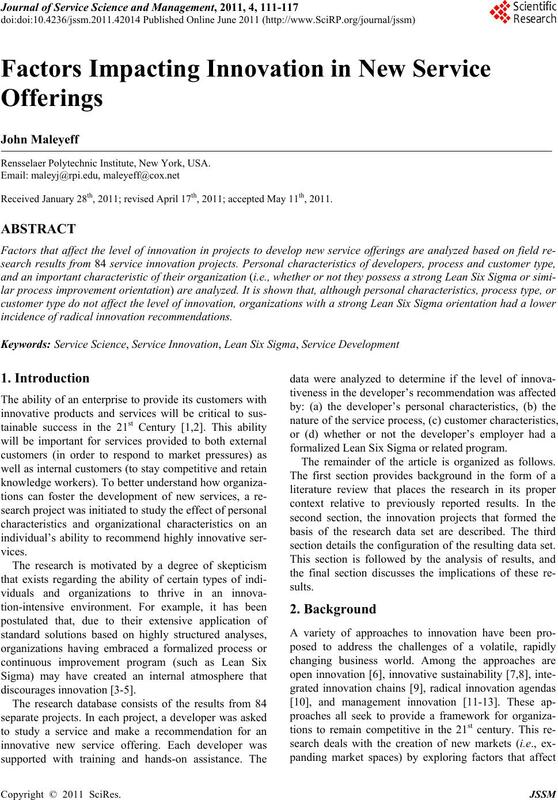 Companies,” Journal of Change Management, Vol. 4, No. Vol. 48, No. 1, 2005, pp. 32-39. Issues, Vol. 18, No. 2, 2006, pp. 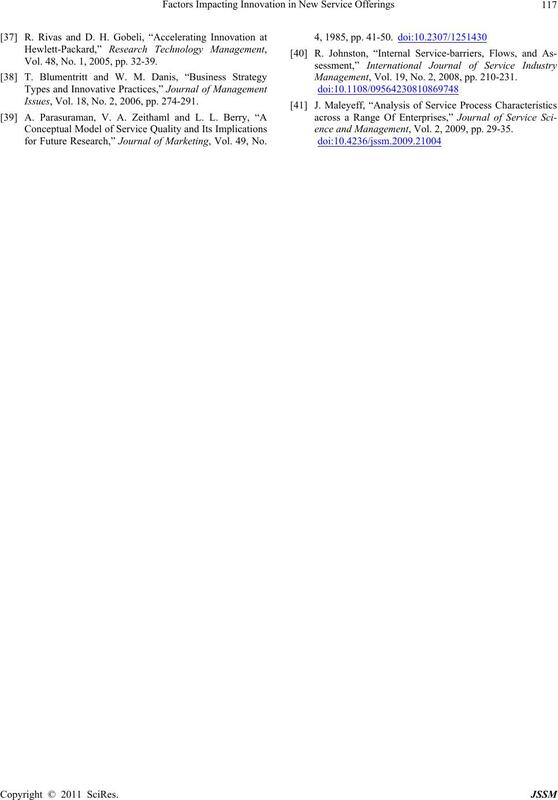 274-291.
for Future Research,” Journal of Marketing, Vol. 49, No. Management, Vol. 19, No. 2, 2008, pp. 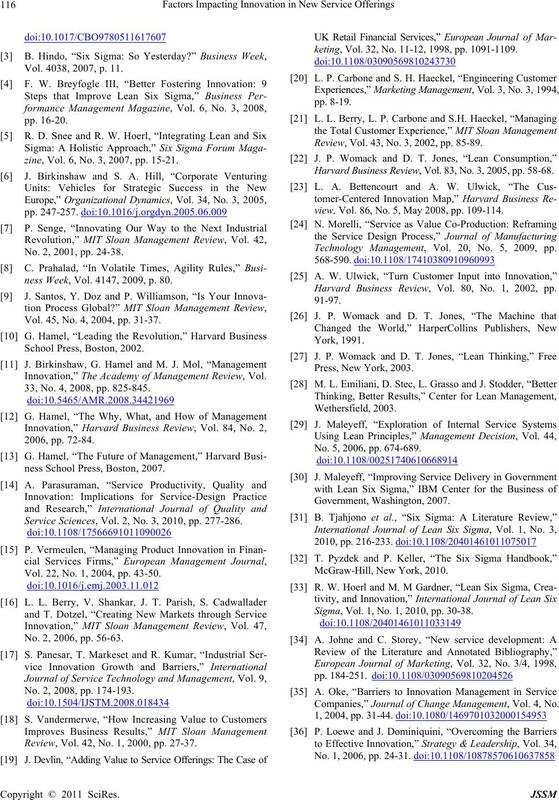 210-231.
ence and Management, Vol. 2, 2009, pp. 29-35.